Coun Wayne Daley, the cabinet member for childrens services. 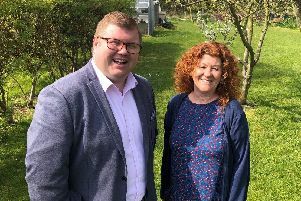 Northumberland is among the councils to hit the Government targets for drawing up plans to support young people with special educational needs. The local authority produces 98 per cent of its Education and Health Care Plans (EHCPs) – a statutory document that contains key information about a child or young person’s aspirations, needs and the provision required to meet those needs – within the required 20-week timescale. This was one of the key positives highlighted by Sam Barron, head of SEND strategy, as she presented her progress report for the past academic year to Northumberland County Council’s health and wellbeing board. National reforms which came into force in 2014 placed a duty on local authorities to lead on integration arrangements between health services, social-care provision and education for children and young people with SEND (special educational needs and/or disabilities). Other positives mentioned by Ms Barron from her report included co-production – ensuring parents and carers are fully involved in discussions and decisions, and improving inclusivity within mainstream schools. On the latter issue, Coun Wayne Daley, the cabinet member for children’s services, said: “Some schools do really well and others, frankly, do not. “We want to share the good practice of schools doing it well, which will reduce the pressure on SEN places. As previously reported, the shortage in SEN spaces in Northumberland is one of the issues which has contributed to the forecast shortfall of £1.6million in children’s social care this year. This will be partly addressed by the 82 places being created by the council at Ashington and Hexham, with work also ongoing to identify new sites, but there is also a desire that children are educated as close to home as possible. The meeting also heard that all areas will receive a joint SEND inspection from the CQC (Care Quality Commission) and Ofsted to examine the local arrangements for children and young people; Northumberland has not yet had its inspection. The health and wellbeing board is made up of county councillors as well as representatives from organisations such as Northumberland Clinical Commissioning Group (CCG) and Northumbria Healthcare NHS Foundation Trust.